The value of a subscription business model is its consistency: predictable revenue to lifetime customer value, you've got a solid foundation to start seeing incredible growth—and that comes directly from becoming the 6 million dollar man of customer acquisition. That's where the subscription model delivers another distinct advantage: The capability to identify your most profitable customers, and the technology—a wealth of key data about marketing, customer and billing events—right at your fingertips. Now how do you turn that data into insights to optimize subscriber acquisition and accelerate your business growth up to 60 mph or more? 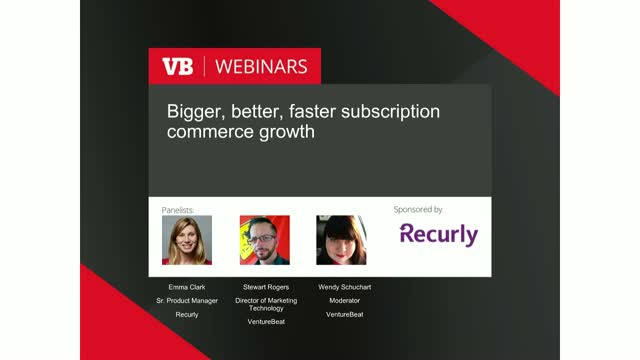 Join this interactive VB Live event to learn how, plus tap into the latest research and benchmarks on key subscriber acquisition metrics. * Capture the key metrics for measuring acquisition performance--plan performance, MRR, LTV and more.